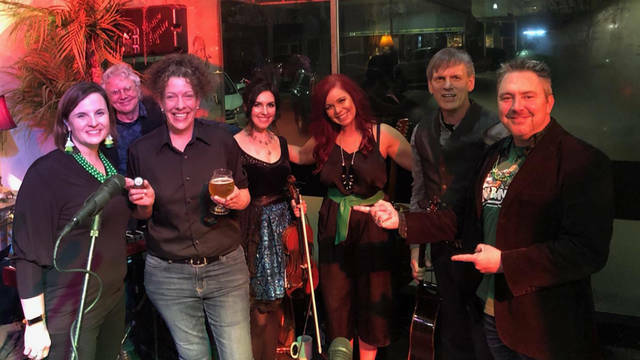 Darke County Center for the Arts’ 2019 Off to the Isle winner Lorraine Grote is pictured with DCCA Artistic Director Keith Rawlins, DCCA Executive Director Andrea Jordan and Irish Wave performers Lone Raven at the recent sold out DCCA fundraising event. GREENVILLE – Darke County Center for the Arts thanked all who made the recent Irish Wave fundraising event a success and recognized the music sponsors Second National Bank, Midmark, Edward Jones Investment representatives Zach Bruening, Ryan Carpe, Dave Connelly and Todd Subler, Dr. Tom Brown and The Andersons, who made the music possible, and event host The Montage Cafe. “Darke County Center for the Arts is grateful for the generosity of our sponsors and patrons who value and are willing to support the arts in our community, providing unique arts experiences right here in Darke County,” DCCA Executive Director Andrea Jordan said. The sold out Irish Wave, hosted at the Montage on March 15, celebrated all things Irish. Attendees enjoyed Irish themed food prepared by the Montage and a tasting selection of craft beers, offered for tasting by Rhinegeist Brewery. Music was performed by returning favorite Lone Raven. A highlight of the festive event was the Off to the Isle reverse raffle drawing for a trip to Ireland. Lorraine Grote, who’s ticket number was the last remaining from those drawn throughout the evening, was the the 2019 winner. “Congratulations to Lorraine Grote the Off to the Isle winner and thank you to all 75 individuals who purchased a chance in the raffle for their support of DCCA and the arts in Darke County,” Jordan said. Irish Wave and Off to the Isle are fundraising events for DCCA; proceeds are used to help underwrite the cost of presenting high quality performing artists in Darke County, as well as preserving Henry St. Clair Memorial Hall as an important cultural center. For upcoming events or further information on the Darke County Center for the Arts, contact the DCCA office at 937-547-0908 or visit its website at www.darkecountyarts.org.